POINT PLEASANT, W.Va. — Not long after Jack Fruth, the founder of Fruth Pharmacy, died in 2005, his daughter Lynne Fruth had to make a decision: continue her successful career in education or take the reins of her father’s business. In 2009, Fruth was elected chair of Fruth Corp., a position that would pose more challenges than she was expecting. The loss of its founder left the company in financial trouble, which was compounded by the recession in 2008. 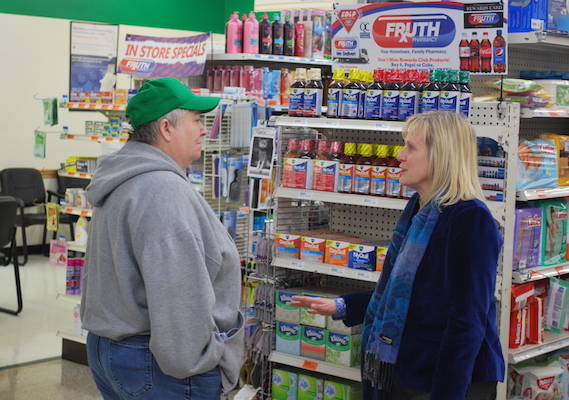 President and chairman Lynne Fruth talks with a Fruth Pharmacy customer. Fruth began to right the ship by visiting all of the Fruth pharmacies and personnel, and refocused the company on her father’s founding philosophy of community engagement and catering to the needs of rural, working-class customers — the company’s key demographic. After making some necessary changes, including changes in management and reestablishing the family’s stake in the business, Fruth began to turn things around, seeing profits after years of deficits. Initially, after her father’s death, Fruth thought everything with the family business was in good shape until she started asking questions and looking more deeply into the books. “At the time, we thought everything was fine, but it wasn’t,” Fruth says. “Along with the economic downturn in 2008 there was a crisis of leadership. I think there was some complacency. Since its founding in 1952, the family-owned drug chain has never wavered from its core mission of serving as a trusted health care provider to people in the rural communities of northwestern West Virginia and southeastern Ohio and giving back to the towns in which it operates. Today, there are 30 Fruth locations: 18 in West Virginia, 11 in Ohio and one in Kentucky. Fruth says that even during the tumultuous time after taking over the company, she never lost sight of the needs of the community, especially the poor, the undernourished, the addicted and those lacking adequate medical care. That personal one-on-one service is what Fruth says distinguishes her stores from others. “If a customer is looking for an item elsewhere and can’t find it, we’ll make sure to find it for them,” she says. Ever since her father, a pharmacist, opened his first store in Point Pleasant, Fruth Pharmacy has been a recognized name for shoppers in West Virginia — and now Ohio and Kentucky as well.